In more than a half-dozen incarnations across four decades, G.I. Joe has become the single greatest brand in the history of boys toys. Inspiring the term �action figure,� G.I. Joe ushered in a new play pattern that forever changed the scope of the toy world. Hasbro has kept G.I. Joe on the market nearly continuously since 1964, with the exception of a few years between the death of the classic �vintage� Joe in 1976 and the introduction of the new �Real American Hero� in 1982. This has not always been an easy task. Conventional wisdom in the toy industry says that a new generation of boys comes along every four years, requiring new and fresh products and new techniques that are needed to successfully market to this changing crowd. As a result, G.I. Joe as a product has assumed many different faces over the years - from military hero to adventurer to Adventure Team member, to Super Joe, to the smaller but no less powerful Real American Hero (which itself changed over time), to Sergeant Savage, to G.I. Joe Extreme, and recently back to 12� Joes with the Hall of Fame, and now the Classic Collection and Timeless Collection. There has never been a toy that has had the complex history of G.I. Joe, and there hasn�t been a boy�s toy, aside perhaps from trains, that has lasted as long. Created in 1963, G.I. 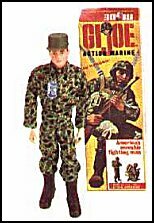 Joe was inspired in part by a TV show called �The Lieutenant.� A licensing agent named Stan Weston brought the concept to Don Levine at Hasbro, with the idea of creating a poseable soldier for boys. Levine and his team of designers ran with the idea, and the rest is history. G.I. Joe was an incredibly ambitious product release, with 75 different products to support the four basic branches of military - Soldier, Sailor, Marine, and Pilot. Sales the first three years were enormous, and Hasbro aggressively rolled out new products that evolved the line, like the Five Star Jeep, Mercury Space Capsule, Deep Sea Diver, footlocker, Green Beret, and Soldiers of the World. Buoyed by their success, Hasbro even tried a few new products, like the G.I. Nurse. She failed spectacularly, and today remains one of the most sought-after G.I. Joe toys. G.I. Joe retained his military theme from 1964 until 1968. By the end of the decade, sales were faltering, as they were for all military-themed toys. It wasn�t until 1969 that the relatively few kids still buying G.I. Joe saw something very different in the toy aisle. G.I. Joe retired from military service and became an Adventurer. He now adventured in outer space, the far-flung African deserts and jungles, and the unexplored undersea world. As unique as it was, the Adventures of G.I. Joe lacked cohesion and direction, and sales continued to falter. By 1970, the world had changed. Joe no longer had an assumed human enemy - instead, he waged war against the environment, battling fearsome beasts and the elements. Capturing tigers and gorillas and recovering mummies and golden idols became the order of the day. As a member of the newly formed Adventure Team, he was devoted to thwarting catastrophe on a global scale. Reinvented for a whole new generation of kids, Joe now sported �Life-Like� hair and beard and soon received the famous �Kung Fu Grip.� A striking new �AT� logo made Joe stand apart from his military heritage. An armada of great, vibrant new vehicles stood ready to transport Joe throughout the world. G.I. Joe�s sales skyrocketed in 1970 and kept increasing after that. The Adventure Team line was more successful than G.I. Joe�s military era. It wasn�t to last, though. In 1975, sales were going down again. New characters were introduced such as Mike Power, Atomic Man. To save costs, Joe�s body style changed radically and the �muscle body� debuted in 1976, along with new characters like Bulletman. It was clear that G.I. Joe had had his run, and sales ground to a halt. G.I. Joe production ceased in 1976. Well, not entirely. In its place was a new concept - an eight-inch figure dubbed �Super Joe� (notice there was no �G.I.� in the title). This line retained the likeness of Joe and the attitude of the Adventure Team, but with a more comic-book and outer space feel. As clever as some of the stuff was, the line did not capture kid�s interests and died after two years. The G.I. Joe brand name was idle for six years before a new line was launched in 1982. This time Joe was scaled down, to a 3-3/4� size already familiar to kids who played with the Star Wars line. This incarnation was very different from previous lines: it was entirely made up of unique characters with exotic code names like �Snake Eyes� and �Scarlett.� The Real American Heroes (as they were known on the packaging) were almost as poseable as the original Joes. Key to the success of the Real American Hero were endless numbers of figures and affordably-priced vehicles packed with play value. These were promoted in a very successful animated series as well as a popular comic book from Marvel. The line was a huge hit with kids, and the line ran for thirteen years - a span identical to that of the original 12� line. Over this time, the line also changed to try and retain its market share. Ninjas became more prevalent, and concepts like the �Eco Force,� �Drug Elimination Force,� and �Star Brigade� were tried and abandoned. Anchored by the 3-3/4� line, a 12� G.I. Joe was re-introduced in 1992 under the Hall of Fame series, which began as a series of large versions of the most popular 3-3/4� Joes. These figures were not very poseable and remain interesting mostly as a footnote to the modern resurrection of the 12� lines. In 1995, after the demise of the 3-3/4� line, Hasbro tried yet again to reposition Joe for the 90�s. Sgt. Savage and His Screaming Eagles retained much of the poseability of the previous line but in a larger 5� size. Even though it boasted a decent science fiction storyline backed by a new animated series, the line failed to generate consumer interest and died in less than a year. G.I. Joe Extreme was another attempt to reposition Joe after the manner of many popular superhero action figure lines, but died after only two assortments. These figures were not fully poseable and could barely stand on their own. They too only lasted one year. Mercifully. In late 1996, Hasbro debuted the Classic Collection, with a body that offers a look and feel similar to the old vintage Joes. So far, Hasbro has produced a blistering number of figures, many of them very good, retaining their roots as toys as opposed to becoming a very realistic scale-model. The Classic Collection continues to evolve as Hasbro tries new things - including licensed character figures (such as Buzz Aldrin), historical tributes to real G.I.s, talking figures, and new ways for adults and kids to interact with their figures. Lately, Hasbro began introducing series reminiscent of the Adventure Team era with their �Adventures of G.I. Joe� line. Also in 1996, John Michlig and Don Levine worked to reintroduce the classic vintage Joe body under the Masterpiece Edition, which was a unique book and figure set published by Chronicle Books. Hasbro has begun to reintroduce its own take of various vintage sets under the Timeless Collection brand. These sets, while not exact recreations of the vintage gems, are pretty close and in some cases take the line in a welcome new direction (like the real metal accessories in the Kay Bee Heavy Metal set and Deep Sea Diver for example). The best of the Timeless Collection has yet to come. For more detailed information on G.I. Joe, and information on the recently published �The Collectible G.I. Joe� (you can buy this great book straight from the author), visit http://members.aol.com/gijoebook/index.htm.